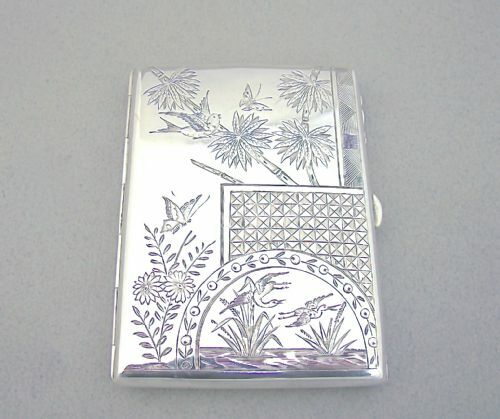 This beautiful Edwardian silver aide memoire is dated Birmingham 1903 and comes in its original presentation box. Of rounded rectangular form, both sides engraved with foliate decorations within decorative borders. The front reserve engraved with initials. Opening to a fitted leatherette interior with ivorine leaf and silver propelling pencil. 4 inches x 3 inches. Silver case in excellent condition with no dings or dents. Leather case in good condition, snaps shut nicely. 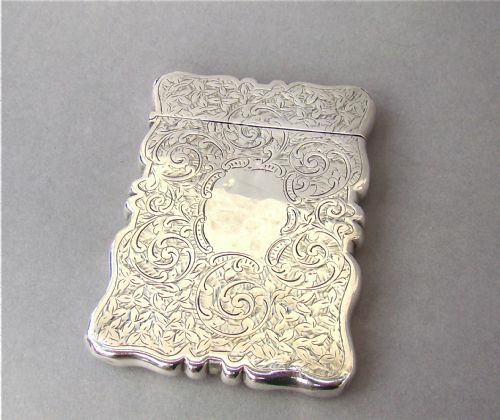 This fabulous Victorian silver aide memoire and visiting card case is dated Birmingham 1885. 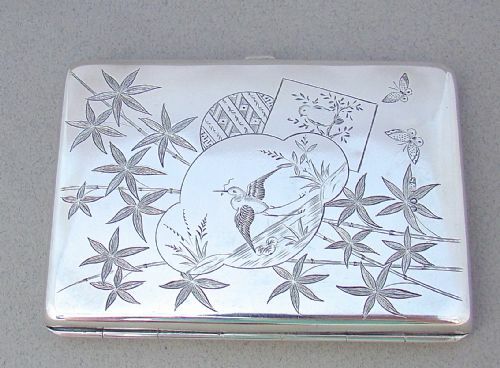 Of rounded rectangular form, the front typically engraved with Aesthetic movement motifs; birds and butterflies amidst leafy bamboo shoots within Japonaiserie patterns. The interior lined with the original red coloured moire silk and dark tan leather. The note book bound with an ivory page. The back plain and fully hallmarked. S&I for Stokes & Ireland. Date letter "l" for 1885. Clean Interior, still very bright in colour pen missing. 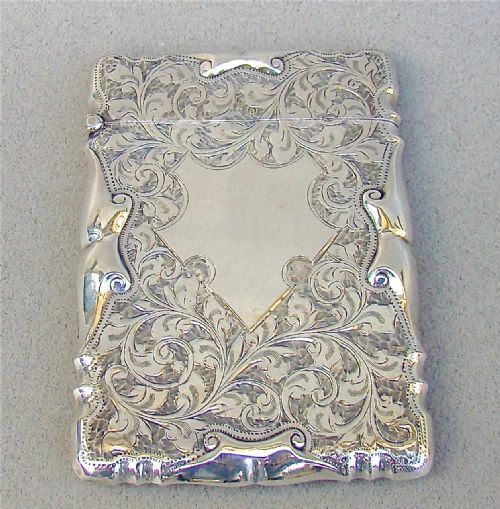 This fabulous Victorian solid silver visiting card case was made at the height of the Aesthetic movement period by the prolific silversmiths Levi & Salaman. Of rounded rectangular form, both front and back typically engraved with Aesthetic movement motifs; ponds and reeds, swifts, storks and butterflies amidst leafy bamboo shoots and prunus flowers, all within Japonaiserie patterns. Date letter "e" for 1879. Clean Interior, a little scratched. 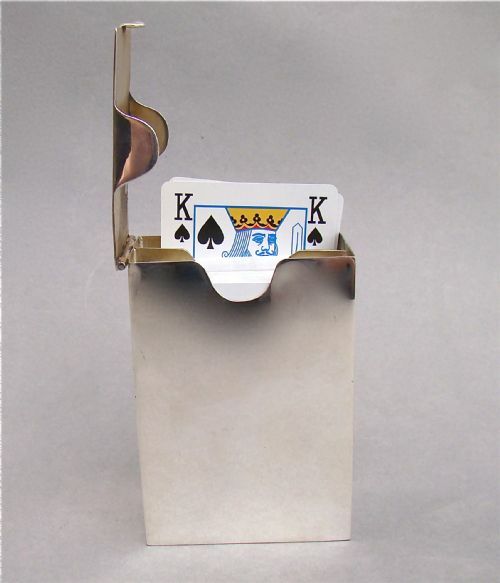 This wonderful solid silver playing cards box has very simple lines, the most exquisite crenelated sides and a very distinctive front catch. It has a modernist feel and is incredibly stylish. The interior is divided in two to fit the pair of playing cards. The front catch fits snugly. Bg&Co for Britton, Gould & Co. Date letter "a" for 1905. Depth: 4cm / 1.4 inches. Weight: 163g / 5.8 oz. 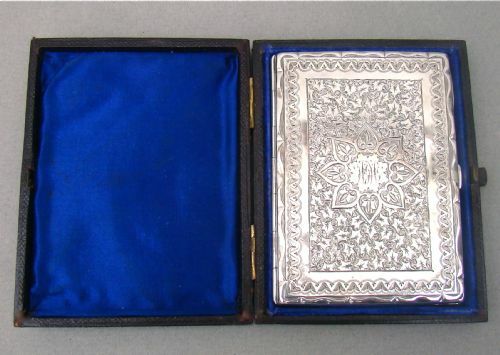 This exquisite Victorian silver & ivory aide memoire and visiting card case is dated Birmingham 1881 and comes in its original presentation box, which is quite rare. Of rounded rectangular form, both sides engraved with foliate decorations within decorative borders. The front reserve engraved with initials. The interior lined with the original teal coloured moire silk, and fitted with a notebook and matching silver pen. The note book bound with exquisite ivory days of the week pages. At the back of the box, is a little silk envelope to carry visiting cards, as can bne seen on the last image, it is big enough for today's business cards. Interior with some ink stains, but still very bright in colour. Leather case in great condition, snaps shut nicely. 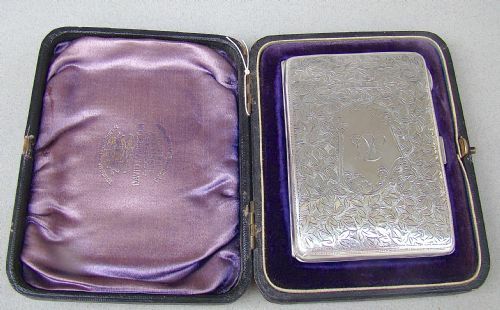 This prettily engraved Edwardian silver visiting card case was made by George Loveridge and is hallmarked for Birmingham 1901. It is of shaped rectangular form, the front engraved all over with foliate scrolls around a vacant cartouche. The back with conforming decorations. GL for G Loveridge & CoDate letter "S" for 1867. 2.5 inches x 4 inches. Minor unevenness to the back. Slight play to the hinge but hinge remains strong. 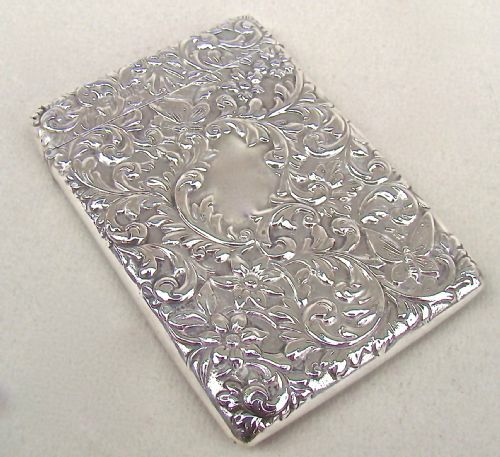 This exquisitely engraved Edwardian silver visiting card case was made by William Hair Haseler and is hallmarked for Birmingham 1904. It is of shaped rectangular form, the front engraved all over with foliate scrolls around a vacant cartouche. The back with conforming decorations. Hinged cover revealing a gilt interior. 2.4 inches x 3.4 inches. 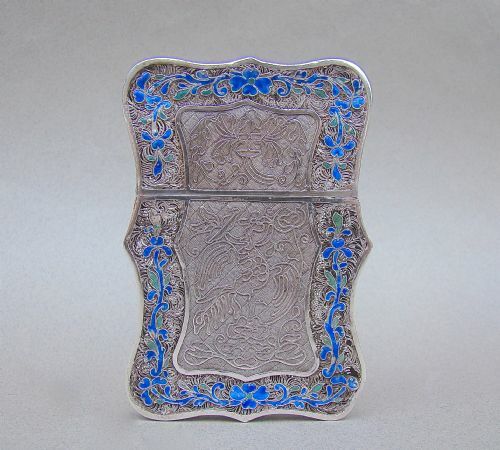 This exquisite and rather unusual Chinese export silver calling card case was made circa 1890. Of shaped rectangular form, the filigree borders with blue and green enamel floral decorations, the front and back with a basketweave background embellished with fine wire filigree depicting a phoenix and lotus design. Pull -off cover and vacant cartouche to the top. Unmarked as per usual with filigree objects but tested as silver. Minor losses to the filigree and enamel commensurate with age. This prettily embossed silver visiting card case was made by the sought-after Goldsmiths & silversmiths and is hallmarked for London 1900. It is of rectangular form, the front embossed all over with foliate scrolls and butterflies around a vacant cartouche. The back with conforming decorations. G&SCo Ltd for the Goldsmiths & Silversmiths Company. Date letters "e" for 1900.
a couple of small dings on corners. 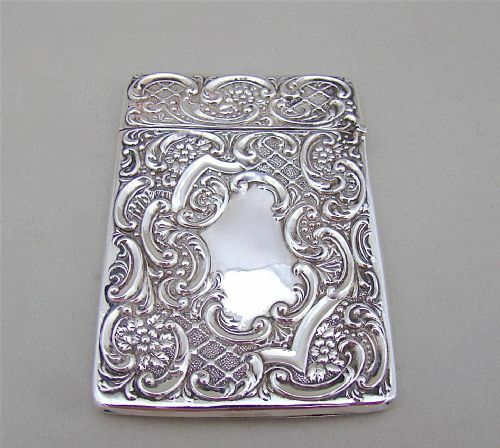 This delighful Edwardian silver visiting card case was made by the prolific silversmiths Crisford & Norris and is hallmarked for Birmingham 1909. It is of rectangular form, both front and back profusely embossed with foliate scrolls on a lattice background . Shaped vacant cartouche on both sides. Date letters "k" for 1909. 2.6 inches x 3.6 inches.